The Burton Dump Truck is the evolution of the Gate Keeper and a really fun ride. If you want something a little softer, more surfy and tapered compared to the Burton Flight Attendant then you have the Burton Dump Truck. Conditions: a Pretty wet day with wet snow but way better than we thought it would be. Approximate Weight: Feels like it’s normal bordering on light. Flex: It’s got a flex that’s kind of medium bordering on med/stiff. Feels like it’s a little more mellow than the well-liked Flight Attendant. Sizing: We thought the 154 might be too small but after riding it I think Peter and me with our 8.5 and 9 shoes. The 163 would be better for Jimbo and Tim with their 11’s but the 158 might be passable. Same with the 158 for Peter and I but if I was going to buy this I’d go 154. On Snow Feel: The Burton Dump Truck has a very fun, semi-locked in off the back foot kind of ride that just loves to carve and make good turns. If you surf it feels like it’s in between a groveler and a performance shortboard. If you only snowboard it’s got a lot of that fun directional freeride feel with a good taste that you get from the more set back, directional surfy shapes too. If you know how to turn a board well it can cruise well but also respond well to more aggressive riding too. It’s a board that has a great personality for most directional riders that like a bit of taper. You can get surfy with it but also still feel a little taste of more of a double ender ride. Edge Hold: It’s missing that magic solid grip that a lot of boards similar to this have but it’s good in most snow you want to ride in. It just starts to slip a little more in those hard patches you can see on some days than others. Turn Initiation: The 154 Burton Dump Truck turned pretty quickly for us and we liked how it snapped pretty quickly from edge to edge. It’s a good board for surfing through trees. It was med/fast bordering on fast and went where ever you wanted it when you wanted it. Turning Experience: The overall turning experience is really fun. It’s very much off the back foot and if you like that style you will find it’s less washy than many 20mm tapered boards. However, if you come from a double ender/aka no taper you might find the tail a bit washy if you don’t have a lot of weight pressuring the back foot edge. Turns of all radius size are fun and its a great board for those that like to make surfy turns. Carving: When the snow is soft this can rail out a really hard carve. It did a pretty good circle carve liked the drive off the back foot from all that rear camber. Skidded Turns: Not the easiest to skid turns since it’s mostly camber. If you get off your game and skid that tail around the wrong way you could pay. Speed: The Burton Dump Truck has very good mountain speed. It’s not made for those who like to bomb everything but instead, it’s made more for turning and getting more surfy on the mountain. Uneven Terrain: Very good in bumpy messy resort snow. It’s the kind of board you could ride all Saturday and if it is sized right to your boots you can weave in and out of bumps like a champ. Powder: There is rocker in the nose, a big nose, a big set back on sidecut, a bigger set back on board and a tapered tail. That means this will float like a champ. Even the 154 we were on would own it in all but the deepest of the deep. The only rides better are the super rockered powder only boards. Buttering: Doable but not great. Switch: Better than we thought thanks to their sidecut tech but it’s still pretty lopsided. Pipe: If this had a little more grip it would be all time for surfing pipe and slashing quarter pipes etc. As long as the pipe isn’t too hard or if you are ok with mid-level edge-hold you will have a great time taking a directional approach to the pipe. Jumps: The Burton Dump Truck is not a board for landing fakie like a true twin in the jump park but it’s got all the pop off the tail you would ever want for directional air. Burton knows how to make a board react after it’s been bent so it likes to ollie off the tail very well. So if you don’t care about landing switch much then this is a great board. So, all in all, we all liked the Dump Truck. I personally feel it will make a lot of riders happy if it fits their specs and riding needs. We try to get as many images of the Burton Dump Truck, but forgive us if they're not all there. 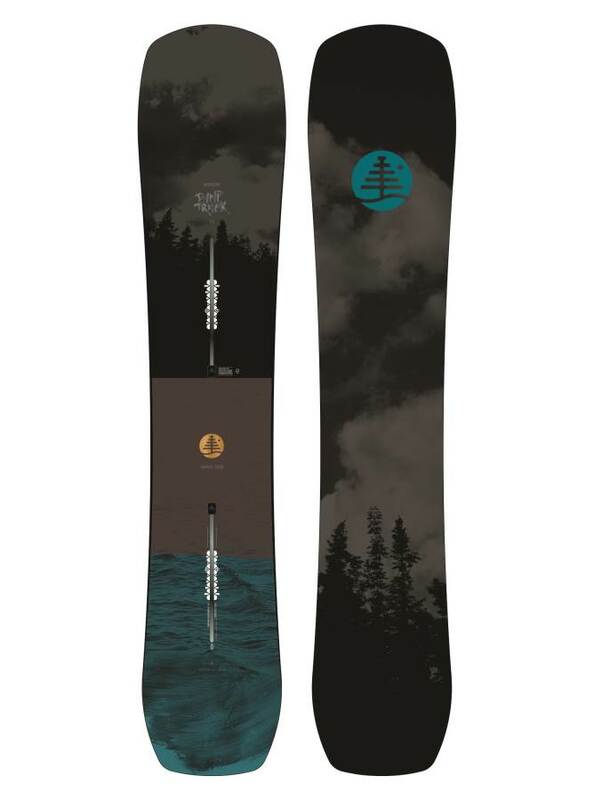 So I\'ve had a \'15 Landlord for a number of years now as my go to freeride board of choice. I sold the LL a few months ago as I had my eye on the \'18 Burton Dump Truck which is basically the superseded LL replacement. Read and watched all the reviews I could find on the DT, especially from the goodride, that spoke positive about its performance but because of the early days out from release, none were very comprehensive at all in details. Anyway, I ended up grabing a 163. Emailed Burton Au\' and there were only 7 coming to Australia in 163. Was able to grab one with almost 30% off when it only just landed a few days earlier in the stores. Absolutely Stoked. It came delivered boxed up and still wrapped in plastic.This board looks so much better in the flesh than in the pics. The blunt shovel nose and tail are a different outline to the LL sharper bullet nose and tail style. It\'s still basically very similar in the profile size being a tapered and directional S rocker but looks a lot more beefier than the the LL. So my first day on this board was spent in Furano, Japan. ?? ?Kitted up this ride with \'18 Genesis EST and Burton Imperials. I\'ve got 36 years experience in the snow and consider my ability at advanced. Well from the 1st turn I made on this board I felt it instantly gelling and blowing me away. I waxed and rotor brushed up prior with Hertal FC739 and had it setup at 15mm to the rear of reference on the front and 20mm back from reference in the rear. What I\'ve noticed straight away with the DT is that you can set down some super heavy high speed carves on the piste with a mind blowing degree of confidence and certainty. This board is moderately stiff, around a 7 with Burton\'s 45 degree carbon highlight weave I was worried that at the speed I was clocking in at I might punch the edge out but the DT did not give an inch. It was almost like you could say, Custom X\'ish. I was dropping down some really hard lines at maximum speed and this board is so much faster than a LL. So the DT has left me so damn impressed with its edge hold ability at speed on the groomed piste, but this is not what the DT is really all about. It\'s a board made for freeriding. So freeriding I went. Venturing into a bit of back country hitting some black level knee deep powder runs. Lucky for me I\'m in Japan and there is no shortage of any of that here. Travelled to Kamui after around a 30cm dump and It did not let me down here either. Was able to set down some great carves in knee deep powder with utter confidence. The blunt nose kept well on top and the tail was so light and surfy. You can so easily throw the tail of the DT around 180 degrees side to side and slash your way through powdery tree runs with complete ease. Got buried numerous times in heaps of powder showers exploding through glorious untouched fresh runs. This board has absolutely no short comings. would not be wrong for me to say that this is the best board I\'ve ever owned. Grab this board if you can it\'s so damn good. Ridden and loved (to death) B Landlords the past 4 seasons and so was hoping this would be a replacement. It is, but has 2mm less taper. This board is notably stiffer and more big mtn than the Flight Attendant - despite what this review says (checkout B's spec's). If you shift both binders up 1" from reference, it will hold edges like a hero, even on hard-pack, and will feel less "back footed" only. The reference marks are only right for deep powder days. Great "swiss army" board for most any conditions.